018. 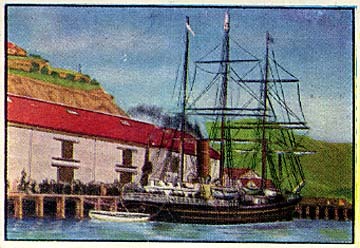 TERRA NOVA LEAVING LYTTELTON. Issued by Sanitarium Health Food Company, Auckland, New Zealand (Date?). No. 352 in a ninth set of 50 cards titled "The New Zealand Treasury of the Years". Size: 2.9" x 2". Recto: Color painted view of the Terra Nova along side a dock. No title.